The Faustian is Nordic - it strives to over-come ugliness. The Classical is Mediterranean - it reposes in its accomplished beauty. The Faustian is promiscuous and has no real conception of Beauty - it loves to portray 'warts and all'. A culture which actually FORBIDS 'idols', and therefore forbids exalted images of human god-like beauty; such a culture inadvertently produces a repugnant human type. Hence the abhorrence of the Classical and Nordic Worlds towards the Semitic. Last edited by Moody; Wednesday, June 21st, 2006 at 06:08 PM. There is a Slavic conception of Christianity - how would you characterise it? The most famous Germanic conception of Christ is that of Grunewald, which can only be described as ugly and pathetic. Last edited by Moody; Wednesday, June 21st, 2006 at 06:12 PM. Thanks for the images, but they smack of Semitic influence to me. Surely paganism is closer to the Slavic Race Soul. Let's try and put these aesthetics into words. Last edited by Moody; Tuesday, April 6th, 2004 at 06:23 PM. *sigh* then you have no knolwedge of Russian art history or even the background behind iconic paintings! "The true Russian is an Orthodox Christian." Pushkin;"then you have no knolwedge of Russian art history or even the background behind iconic paintings!" Moody; Here Pushkin completely misunderstands this thread by trying to hi-jack it for his Christian fanaticism. To state the intention of this thread; I am looking at the way RACIAL TYPES are represented in the art of peoples. I am responding to that in a philosophical way [so we don't need a whole load of pictures without commentary]. My response to the Byzantine style art posted by Pushkin is a true one. I take it the artists were aware that their religion and its main proponents were of Middle-Eastern origin [Russia didn't convert to Christianity from Slavonic paganism until 988 AD! ]; therefore they tried to portray a vaguely Semitic type; dark-haired, sallow skinned and hook-nosed. 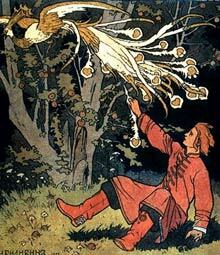 For a Slavonic type, see the pagan-inspired art-work of I. Bilibin. Moody; Again, that is irrelevant; this is not about the Orthodox religion - use the religious forum for all that kind of stuff. I am looking here at racial aesthetics. Luckily, others here seem to have got it. The cult of the Ugly is something Faustian, and appears in Romantic Art. The Aryan body can be sick, as in Romanticism, or healthy, as in Classicism [to paraphrase Goethe]. 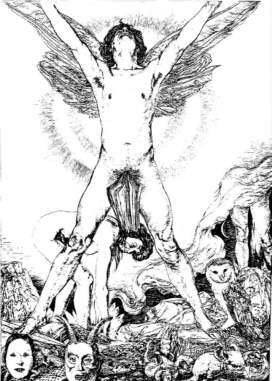 As some here have rightly said, this is the source of the transgressive aspect of Aryan culture, that dark satanic side, inhabited by the likes of the English artist Austin Osman Spare. Last edited by Moody; Tuesday, April 6th, 2004 at 06:19 PM. After claiming Russian traditional Christian sacred art as "semitic". You're claiming the Mederitarian is Classical, the Nordic is Faustian, and I'm claiming the Slavic is Christian. And I sincerly suggest you some books on Russian history and Russian culture to see why I have come to that conclusion. Nevermind the fact that Christianity was brought to them by Greeks and was heavily Slavic in nature. Thank you for once again demonstrating your lack of knowledge on Russian history! Thank you for trying to imply I don't know anything about Russian history. I know full well the year when Prince Vladimir converted Kiev to Christianity. ; therefore they tried to portray a vaguely Semitic type; dark-haired, sallow skinned and hook-nosed. And where exactly is that in the icons? Good, but fails to refute my argument. Indeed I love how later you try to deflect this is not about religion, yet openly declare twice in this thread about how paganism is closer to the Slavic soul. I find that ironic considering you're not even Slavic and have plenty shown a disregard for anything Slavic, even to the point of showing a contempt for anything Slavic. Actually it is relevant Moody, because time and time again you fail to grasp the influence that Orthodox Christianity has had on Russia and its identity. Its influenced us in our culture, our art, our philosophy, etc. You simply are unable to understand this and make rude knee-jerk remarks about my peoples sacred art being "semitic". And in a further insult, you try to cover up your Russophobia by claiming to be supportive of Slavic paganism. Whats quite ironic is that I have yet to meet a Slavic pagan who would denounce Orthodox Icons as "semitic". Indeed Moody, why don't you actually try doing that some time, going to a Slavic pagan and talk about how their peoples traditional art is "semitic". use the religious forum for all that kind of stuff. I'm not the one who brought up Slavic paganism as closer to the Slavic soul. I stated an obvious fact known to anybody who has considerable knowledge about Russian history and culture about the heavy influence of the Orthodox church on our peoples art! became a cherished part of national identity. Rublev's icons came to represent the nation's spiritual unity. What defined the Russians - at this crucial moment when they were without a state - was their Christianity. Yeah it was so semitic, uh huh sure! I am looking here at racial aesthetics. As am I, you're just pissed because my peoples aesthetics don't conform to your Nietzchean worldview; as it shouldn't since Nietzsche's theories were Germanic not Slavic and in fact ran counter to much of what Slavs hold dear and true. Funny you often accuse me of being too much of an universalist, when you're even a bigger universalist then me. You seem to think the Germanic form of nationalism/particularism is the only true way and thus all Europeans must follow its path. Well the Slavs believe very differently from the Germans in many key areas. The German idea is the idea of rule, dominance, of might, wheras the Russian idea is the idea of community and the brotherhood of men and peoples.....In German thought itself there is an element hostile to us; this is the case in Hegel, Nietzsche and, however strange it may be, in Marx. We are bound to desire brotherly relations with the German people, who have achieved much that is great, but on the condition it repudiates the will to power.....The ethical ideas of the Russians are different from the ethical ideas of Western peoples, and they are more Christian ideas. Russia's moral values are defined an attitude towards man, and not towards abstract principles of property or of the state, nor towards good in the abstract." So don't say I'm just acting like some Christian fanatic who doesn't understand aesthetics here. I know perfectly what I'm talking about, I'm talking about the aesthetics and art of the Slavic people; who place strong emphasis on our sacred Christian art; and as Figes correctly pointed out, formed an important feature of our national identity! A simple fact you seem either unable or unwilling to get, and instead choose to make cheap shots at my peoples heritage! Hey let me guess, this icon is also "semitic" in nature as well?